(Newser) – Doink-doink. 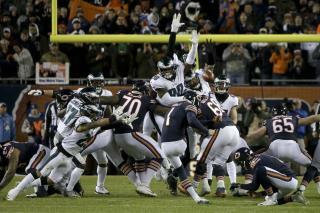 Bears kicker Cody Parkey missed a 43-yard field goal in the final seconds Sunday night when the ball hit the goalpost, then the crossbar, and bounced out. That allowed the Eagles to win the playoff game, 16-15, and earned Parkey goat status—especially since he had hit the goalpost five previous times this year, including four times on the first game of the year, notes the Washington Post. But Parkey perhaps shouldn't be shouldering all of the blame—it now looks like the Eagles' Treyvon Hester tipped the ball near the line of scrimmage. As CBS News reports, it's hard to see in this real-time video. Instead, look at this slowed down video. Fake news, yet again. It wasn't the "...first game of the year.." when Parkey doinked 4 in one game. Newser & Washington Ghost...u suk. Oh yeah, blame the Bear's leading scorer on the day for their loss. That makes lots of sense. I have seen a lot of crazy things in my time watching Chicago Sports but the Doink-doink might be the single most astonishing thing I have ever seen.